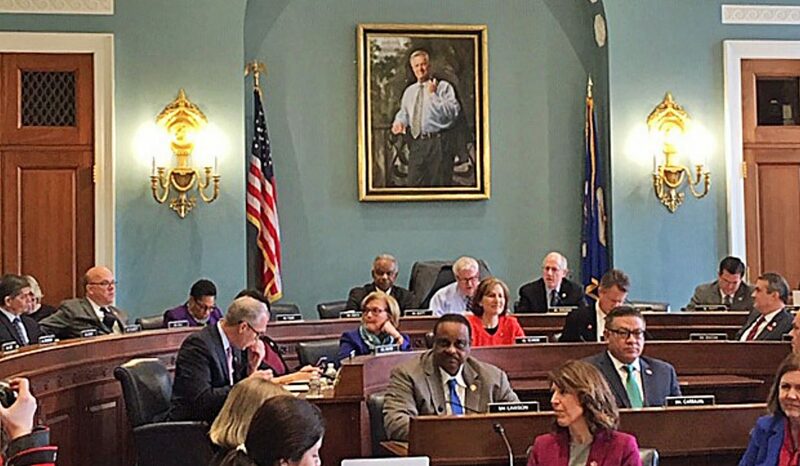 The House Agriculture Committee meets to organize itself for the 116th Congress. Chairman Collin Peterson, D-Minn., who has chaired the committee previously, sits beneath his own portrait, which was painted after the Republicans took control of the House after the 2010 election. House Agriculture Committee Chairman Collin Peterson, D-Minn., said Feb. 7 that reauthorization of the Commodity Futures Trading Commission and the Pesticide Registration Improvement Extension Act are his top priorities at the full committee, and that he will leave oversight mostly to the subcommittees. 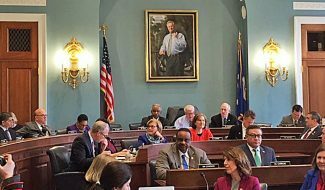 After the committee passed rules for the 116th Congress and he and House Agriculture ranking member Michael Conaway, R-Texas, introduced new members, Peterson said "We've got a lot of work to do." "We have a great opportunity to drive real, tangible and bipartisan progress for Americans in all communities, rural or urban, from this committee. Now it won't be flashy — as far as I know, nobody's ever accused me of that — but it will be important work," he said. "We'll look at the state of the farm economy; the struggles facing our dairy farmers; and the impact of the trade war. We will also monitor USDA's progress implementing the farm bill; the ongoing evolution of the RFS (Renewable Fuel Standard); the ability of farmers and ranchers to adapt and to help mitigate the effects of climate change through our conservation and energy programs; and the ability of the Forest Service to address the evolving threat of wildfires," Peterson said. "Also, we will work to provide responsible oversight of USDA." Peterson also said his biggest priority for the farm bill is speedy implementation of the dairy section, and that he wants a member of the committee to become an expert on the dairy program and milk marketing orders, which are some of the most complicated farm programs. After the meeting, Peterson told reporters that the first goal is to get dairy farmers to sign up for the new Dairy Margin Coverage program, but he noted that the industry is encouraging them to. The program is so generous, Peterson said, he believes it should "sell itself," but it is also complicated because dairy farmers should sign up for related crop insurance programs as well. On oversight, Peterson told reporters "we're going to be bipartisan — no 'gotcha.'" Peterson said he would let members bring oversight ideas to him, and that his personal priority is examining government purchases of land through conservation programs. He said both USDA and the Interior Department's Fish & Wildlife Service should end the purchase of land and that he has "horror stories" that "I will expose" within the USDA programs over which the committee has jurisdiction. Reauthorization of the CFTC will begin with the Commodity Exchanges, Energy and Credit Subcommittee, he said. On PRIA, the pesticide registration act, Peterson said the House Republicans refused to vote for a bill that the Senate passed last June because they objected to a provision written by Sen. Tom Udall, D-N.M., that preserves two rules by the Environmental Protection Agency: the updated Agricultural Worker Protection Standard and Certification of Pesticide Applicators Rule, which provide safeguards for farmworkers, and particularly children, from toxic pesticide exposures. The Environmental Protection Agency signaled it would roll back those regulations, but has since retreated from that position, the Los Angeles Times reported. Peterson said the American Farm Bureau Federation still objects to those regulations and the bill's provision to preserve them, but that he believes their concerns are overblown. He said he would prefer to pass the Senate bill, but House leadership is trying to determine if there are enough votes.